• Fully compatible with MPEG2 and DVB-S.
• Memory for 5,000 channels. • 8 groups of favorite channels. • Support for 256-color on-screen menu (OSD). • Support for up to 16 TV guides and 8 timers. • Teletext support (up to 800 pages) and subtitles. • Powerful editing function channels. • Supports "Picture in Picture». • Support AV and SCART outputs. • Support the zoom function. • Fast software update via the USB-output. 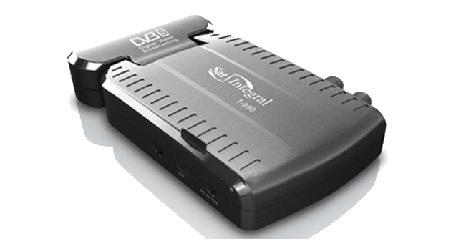 • Recording of TV programs (TS format or PS) and playback via USB or HDD. • Possibility of delayed write (2 records without the support functions; 1 a record with the support functions). • Supported file formats: JPEG /BMP /MP3 /WMA /MPG. • Slideshow mode JPEG files, playback of TV programs in OGG format, viewing one channel while simultaneously recording another. • Ability to record in real time. To enable /disable Patch menu, enter the receiver menu (MENU button), and enter the MUTE + 999 with the remote control. The screen will display "On Emu." or "Emu off."